Municipal Solid Waste (MSW)—more commonly known as trash, rubbish or garbage—consists of everyday items that are discarded by the public, such as food and kitchen waste, paper, glass, bottles, cans, toys, Tetra Packs, fabrics, clothes, batteries, electrical appliances, TVs, computers, construction and demolition waste, medical waste etc.. This waste stream comes from our homes, schools, hospitals, and businesses. Proper handling and disposal of MSW is a growing concern as the volume of waste generated worldwide continues to increase at a fast speed. Municipal solid waste recycling becomes a hot topic. Treatment of Municipal Solid Waste starts with collection and sorting. During sorting, recyclable materials like paper, glass, plastic, and metals got separated from the trash and further enter various recovery processes enabling them to be used to make new products, reducing the amount of virgin raw materials needed and thus help preserve natural resources. After removing the recyclable materials, combustible non-recyclable waste materials are further separated from the waste stream and processed using waste to energy technology to obtain a product with a high calorific value called RDF (Refuse Derived Fuel). RDF serves as a great substitute for traditional fossil fuels like coal or oil. Use of RDF benefits the environment by greatly reducing the emission of CO2 from the burning of fossil fuels. Without this energy recovery technology, non-recyclable refuse would simply end up in landfill or get incinerated, with a negative impact on the environment. Organic portion of the MSW are processed through composting in which organic waste, such as food scraps and yard trimmings, are collected and stored under conditions designed to help it break down naturally. This resulting compost can then be used as a natural fertilizer. At last the left over residual with the usable materials removed will be disposed through landfill or incineration. 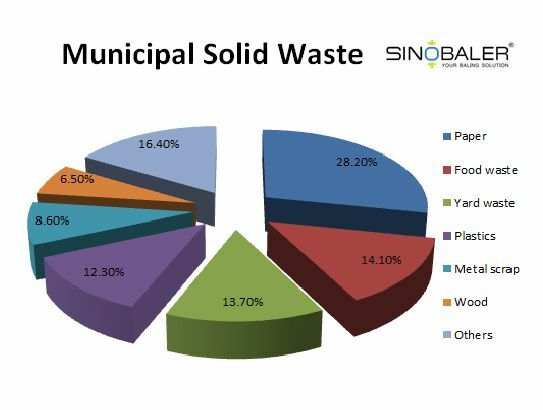 Municipal Solid Waste Recycling now is more and more important in both economical benefits or environmental benefits. SINOBALER offers baling machines, shredding machines and granulating machines with very wide applications. Contact us for any concerns in your waste recycling practise. What Metal Scrap can be Recycled?